On Tuesday the first book known to be written about a stock exchange went on sale at Sotheby’s Rare Books and Manuscripts online auction, carrying an estimate of $200,000 to $300,000. Written by Joseph Penso de la Vega in 1688, the Confusion of Confusions is a primer for the Amsterdam stock exchange, which was set up by the Dutch East India company in 1602. Bids close on Dec. 17. Vega, a Sephardic Jew who had immigrated from Spain to Amsterdam earlier in the century, wrote the book in Spanish and described the mechanics of the exchange—including descriptions of puts, calls, pools, and manipulations—in addition to providing overall investment advice. Given that Vega was writing a book about a Dutch stock exchange in Spanish, it “probably meant it was aimed at the Sephardic community,” says Selby Kiffer, an international senior specialist in Sotheby’s books and manuscripts department who’s in charge of the sale. In his preface, Vega expresses a desire to dispel “confusion” about the exchange, adding that he’d like to provide a few warnings about less-than-honest practices. He also hastens to add that the book was written for his own enjoyment. Vega, Kiffer says, “describes the market as an honest operation and an honorable business, but he nevertheless warns readers that there are some people who will try to take advantage of you.” The text is written as a series of dialogues among what Sotheby’s describes as “stock characters,” including a philosopher, a merchant, and a shareholder. Despite its wisdom, not to mention its historic import, the book remained relatively obscure until the late 19th century, when a series of economists—first German, then Dutch—began to draw on the text; the first translation appeared in English in 1959. Today a copy is available in hardcover for less than $30. The book on sale at Sotheby’s is a first edition. The auction house estimates there are fewer than 10 in existence. 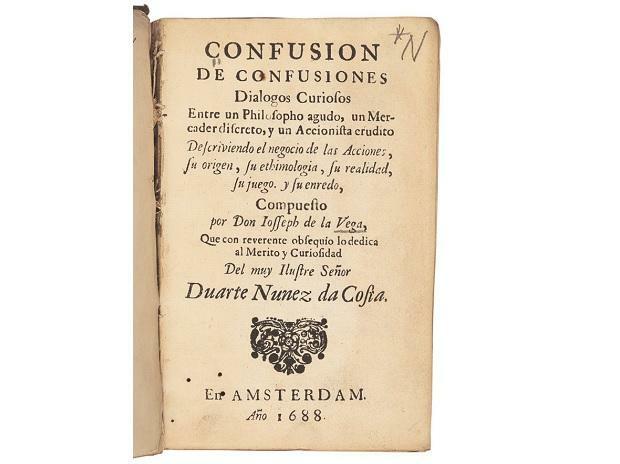 The most recent sale of a Confusion of Confusions first edition was more than 30 years ago, when Sotheby’s London sold a volume for £16,500, which at the time converted to about $29,000 dollars. The book is being sold by the Jewish Theological Seminary, and Kiffer says that given its lofty price, he’s almost certain it will be sold to a private collector, possibly someone in finance.